Forget about probabilities and statistics and measures of so-called leading indicators (such as the stock market which does not lead), and the yield curve that is useless when zero-bound. Instead, simply focus on data from around the globe, especially new orders. The global economy skirted closer to stagnation at the end of the second quarter. 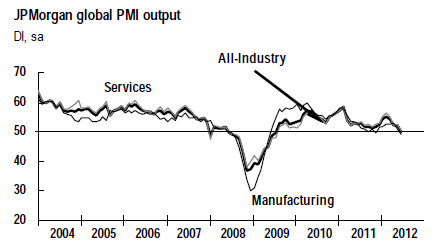 Growth slowed in the service sector and manufacturing production fell back into contraction territory. The JPMorgan Global All-Industry Output Index – produced by JPMorgan and Markit in association with ISM and IFPSM – slipped to 50.3 in June, down further from February's 12- month peak of 55.4. Commenting on the survey, David Hensley, Director of Global Economics Coordination at JPMorgan, said: "The PMIs suggest that the global economy downshifted into neutral gear in June. Output and new order inflows were only marginally above stagnation levels, signalling that global GDP growth over Q2 2012 as a whole will be the most sluggish for around three years." US Services ISM: ISM's Non-Manufacturing New Orders Index grew in June for the 35th consecutive month. The index registered 53.3 percent, a decrease of 2.2 percentage points from the 55.5 percent reported in May. Eurozone Manufacturing PMI: The level of new export orders subsequently fell at the fastest pace since last November. The German export engine in particular continued to sputter, with new export business falling at the most substantial pace since last November. Only Greece reported a steeper rate of export order book decline than Germany. Germany Manufacturing PMI: Sharpest drop in new export orders since November 2011. June data highlighted another marked reduction in German manufacturing output, as shrinking new order volumes continued to squeeze production requirements. The reduction in new work extended the current period of deteriorating order books to 12 months. France Manufacturing PMI: Underlying the fragile performance of the manufacturing sector during June was a further reduction in the level of incoming new orders. Backlogs of work decreased at an accelerated pace in June, with the rate of contraction the sharpest since May 2009. Correspondingly, employment was cut at the fastest pace for 33 months. 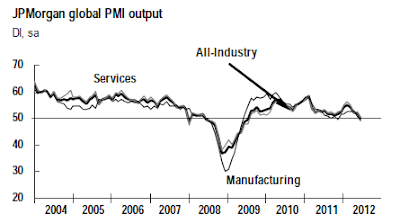 Italy Services PMI: Job shedding accelerates to solid pace. Outstanding business decreased at an accelerated rate in June. Overall rate of backlog clearing was the sharpest since October 2009. Spain Services PMI: New business fell sharply again and firms lowered employment. New orders decreased for the twelfth successive month. China Services PMI: New order growth in China’s service sector eased since the month before, with the index measuring trends in overall new work at a ten-month low. This, coupled with an accelerated decline in new orders placed at goods producers, meant that overall new work fell for the first time in 2012 so far. China Manufacturing PMI: New orders fall to greatest extent in seven months, as export orders slump. A lack of demand was behind the latest deterioration in operating conditions, with total and foreign new orders falling at accelerated rates in June. New export orders placed at goods producers dropped at the steepest rate in over three years. North America and Europe were both cited as sources of new order book weakness. Japan Services PMI: Subdued growth of service sector new business meant that companies transferred spare resources to completing existing workloads in June, with backlogs of work falling further. Rates of decline in outstanding business were broadly similar across both manufacturing and services. Japan Manufacturing PMI: June data pointed to the first month-on-month reduction in manufacturing output since December 2011, as both new business and new export orders fell. The one and only bright spot in that entire mess is the US non-manufacturing ISM (assuming a drop in new orders from 55.5 to 53.3 is a bright spot). Otherwise, every country is contracting or on the verge of contracting with a noticeable contraction in new orders. Germany and France, the two largest Eurozone economies are sinking fast. Focusing on one indicator is normally a mistake, but this data is pervasive. Moreover, given the global economy is already in serious stagnation trouble, a plunge in new orders across the board is likely to mean one thing only: global recession. In 2007 all sorts of ridiculous decoupling theories, US hyperinflation scenarios, US treasury crash scenarios, crude is going to $200, Natural Gas is going to $40, and other nonsensical ideas came out of the woodwork, many in book form, some still persisting to this day. Instead, the reverse happened! It was the US that decoupled from the global economy. Moreover, China has been exposed for the malinvestment bubble that it is. Now, in 2012, nearly everyone but the die-hard hyperinflationists thinks the US will decouple from the global economy. This reverse-decoupling idea is primarily based on the absurd belief the Fed will not let the economy or the stock market down (when the Fed is in fact not in control). For further discussion, please see Is There a Limit on Central Bank's Ability to Inflate? The debate on the Fed will remain, but the facts show that I disagreed with decoupling in 2007 and I disagree with reverse-decoupling theories now. Please see 12 Reasons US Recession Has Arrived (Or Will Shortly) for detailed rationale.